I've always found the way we "judge" and "rank" quarterbacks as individual players to be very interesting. First of all, there is the obvious contradiction that we claim to view football as "the consummate team sport where no one player is bigger than the whole," yet judge quarterbacks largely on championships and win percentage. It's funny because, other than the hated LeBron James, we don't view basketball, a sport where one player's impact is far greater, in the same light. But it isn't that we somehow value winning more in football than any other sport, because nobody will ever say Randy Moss' career was a wash without a Super Bowl. But Dan Marino? He just couldn't get the job done. Never mind the fact that Marino made average receivers look Hall of Fame worthy for nearly two decades, and that his Dolphin teams rarely had any semblance of a running game or a serviceable defense, the guy just wasn't a winner! Basically, what I'm getting at is the recent quarterback opinions of two former jocks. First, ESPN's Ron Jaworski ranking Joe Flacco in his top-5 quarterbacks (Ahead of Drew Brees, Ben Roethlisberger and Eli Manning), and former Giants running back Tiki Barber saying that Eli is now better than big brother Peyton. Jaworski is clearly basing his opinion on Flacco's impressive 2012 Super Bowl run that saw him capture the game's MVP award, but is also most definitely falling victim to recency bias. Drew Brees and Eli Manning have put up superior numbers to Flacco throughout their careers, done a great deal of winning, and each has a Super Bowl MVP award in their trophy case. Heck, Eli has two, and he beat the great Tom Brady both times. Then you have Roethlisberger, a two-time Super Bowl champion that has posted better numbers than Flacco every year the two have been in the league. 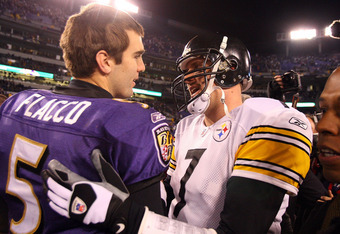 Clearly, whether you're looking at winning or significant numbers, Flacco should be behind these guys. But, when you cut the sample size down to Flacco's four-game playoff run, he looks like an all time great. On to Tiki's comments about Eli being better than Peyton, despite the fact that Eli led a team with Super Bowl talent to nine wins last year, while Peyton elevated an eight-win team to the top seed in the AFC. Both have made multiple Super Bowl appearances and each has made big plays in the big game, but Eli's plays have been of the "holy crap I can't believe that just happened variety." Basically, they've been kind of lucky. We do remember that "luck" is a thing, right? This isn't to take anything away from Eli. Like I said above, I would rank him ahead of Flacco, but there is just no metric other than "two Super Bowl wins is greater than one" that makes him better than Peyton. Here is what Tiki Barber said when asked why he thought Eli was better than Peyton. "Because of clutch. What matters in sports? It's winning and losing. You get to the stage and what do you do? Eli's gotten there, and he's won," Barber said. And with that quote, every stat nerd in America just slapped their forehead. "Because of clutch…" As if winning 10 games every year he's been healthy since 2002 isn't as impressive as making three great throws in two separate games. This is where I feel like people quickly split when judging NFL quarterbacks: Is it about the numbers over a long period of time? Or, is it about winning and "clutch" moments? Stat nerds will tell you there is no such thing as "the eye ball test" or the "clutch gene," but surely performances like Eli's in Super Bowls XLII and XLVI and Flacco's last postseason matter, don't they? I mean, you play to win the game, so a quarterback that wins games should be valued. But, when there are metrics telling you that Flacco is delivering roughly the amount of wins expected to the Ravens, given the number of yards their defense surrenders, then you have to consider that maybe the quarterback isn't the only guy doing the winning. The numbers say Flacco is an average NFL quarterback, I think he's better than that. I think having a guy that can get hot at the right time is something you want and that, given the green light, Flacco can put up some big numbers and help you win a championship. That last part isn't opinion, we just saw it happen. But, I also believe that having the guy that posted the lowest QBR of ALL TIME as my leader would make me a little nervous. Then you have a guy like Matt Ryan. All of his numbers point toward him being an "elite" top-5 quarterback right now, but doesn't it feel like he should win something first? Ryan just won his first playoff game, and that's only because the Seahawks totally wet the bed. For the record, I would take him over Flacco, and probably over Eli right now, but Ryan has one of the best receiving corps in the league and one of the best tight ends of all time to throw to. Maybe his numbers aren't as impressive someone as like Brees who threw to a good, but not great, group of receivers. After all, numbers mean nothing in a vacuum. Getting back to the basketball comparison, would we ever give a point guard this much credit/blame for wins and losses? I mean, the point guard is the quarterback of a basketball team (sort of), but the responsibility of winning always falls on the shoulders of the best player, regardless of position. So, then why aren't we declaring Haloti Ngata or Ray Rice "elite?" Flacco was probably the 5th or 6th "best" player on the Ravens, so using one hot streak to call him elite is the equivalent of saying the Miami Heat's 2012 title finally validated Mario Chalmers as one of the game's premier point guards, and that 2013 put him in the conversation with the all time greats. Sounds ridiculous, I know, but then you look back and realize that Flacco has no All NFL or Pro Bowl selections, and that his QBR is worse than Jake Locker's and 25th in the league. Would we ever say that an NBA player with no All Star appearances that ranks somewhere in the bottom third of the league among starters at his position in offensive efficiency is "elite?"